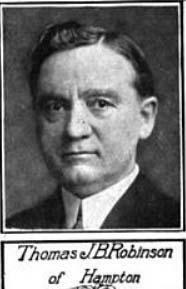 Senator from the Forty-third district, composed of Cerro Gordo, Franklin and Hancock counties, was born in New Diggings, Wisconsin, August 12, 1868, of English ancestry. He moved with his parents to Hampton, Iowa, in 1870, and attended the public schools of that city. Following his graduation from high school he entered the banking business in which he has gained great success. He is president of the Citizens National Bank of Hampton, director of the Coulter Savings Bank of Coulter and a director of the Alexander Savings Bank of Alexander. Was president of the Hampton board of education, a member of the Hampton library board and a trustee of Cornell College. Married Miss Belle Clinton and to them have been born two sons and three daughters. Is a member of the Methodist church and of the Masonic order, in which he has attained the rank of Shriner. Elected senator in 1912. A republican in politics.